Step 1 Preheat oven to 375 degrees F (190 degrees C). Line 12 muffin cups with paper liners. Step 2 Whisk whole wheat flour, brown sugar, baking powder, cinnamon, baking soda, salt, and nutmeg in a large bowl. 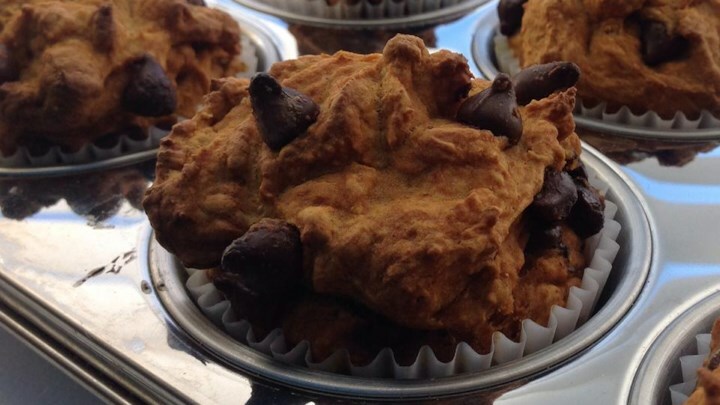 Stir pumpkin and water into dry ingredients, mixing until just moistened; fold in chocolate chips. Spoon batter into prepared muffin cups, filling them to just below the tops. Step 3 Bake in the preheated oven until lightly browned and tops of muffins bounce back when pressed lightly, 25 to 30 minutes. Let muffins cool in pans for 5 minutes until removing to a wire rack to cool completely.